Download Valentines Day Shopping Sale Flyer Template PSD. This Valentines Day Shopping Sale Flyer Template PSD design can be used for a Fashion Sale Event, E-Commerce Sale, Winter & Summer Sale Event, Free Shipping Promo & Sale Flyer. 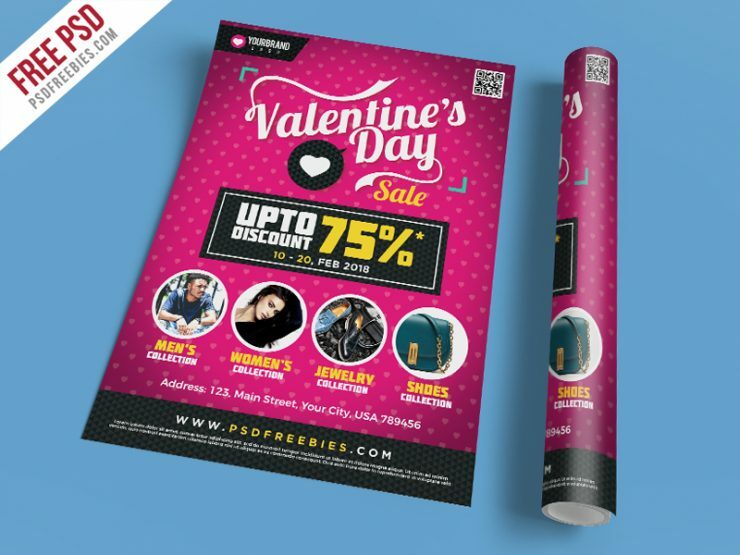 In This Valentines Day Shopping Sale Flyer Template PSD all elements are designed based on custom shapes, so you can change the colors as you like also you can scale any layer up or down without losing quality. This Free Flyer Template is A4 Size 300 dpi print-ready CMYK PSD file. Very well organized proper name groups. Very easy to edit and change text as per you sale info. Hope you like it. Enjoy!